Frightened by creepy confessionals lurking in the dark corners of churches? Reluctant to go inside because it feels like a rerun of a scene from The Godfather? Now you can blow away those cobwebs and put an end to predatory priest misery with the new, light'n'breezy IKEA confessional box. Just plonk yourself down and chat into the grille to the priest on the other side. And why not order a burger with a side of fries while you're about it? 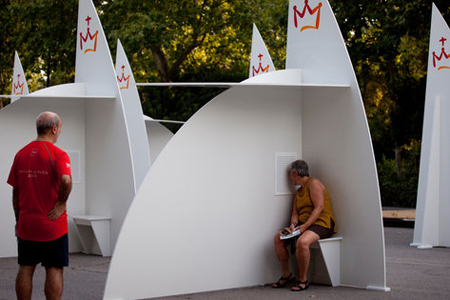 Developed specially for Papa Ratzi's World Youth Day in Spain, 200 of these babies are sitting in a Madrid park waiting for customers.